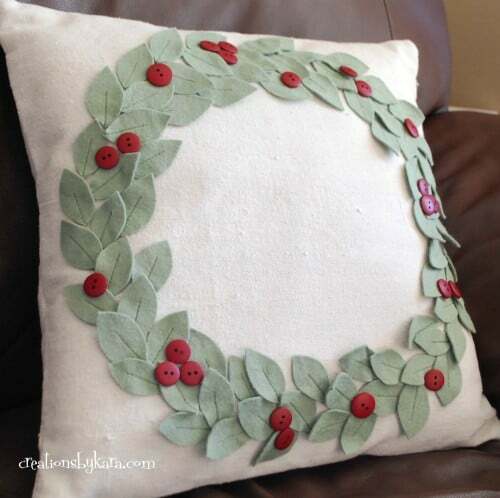 You can make this Pottery Barn Knock-Off Christmas Pillow in any color to match your Christmas decor. Such a fun project! I actually have bucket loads of Christmas decor. But every year I find new awesome projects that I just have to make. What can I say, I love decorating for Christmas!! One thing I don’t have is Christmas pillows for my living room couch. So I knew just what I needed to make for this collaboration. By the way, have you seen how many gorgeous Christmas pillows there are out there? It was seriously hard for me to pick one. I think I’m going to have to make a few more. But first things first. 😉 I found this pillow on the Pottery Barn website. I love how it turned out, but I wish I would have made the wreath a little smaller. I have adjusted the instructions so that it doesn’t go so close to the edge. 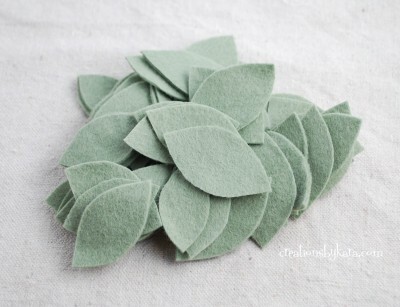 Cut a whole bunch of leaves out of felt. 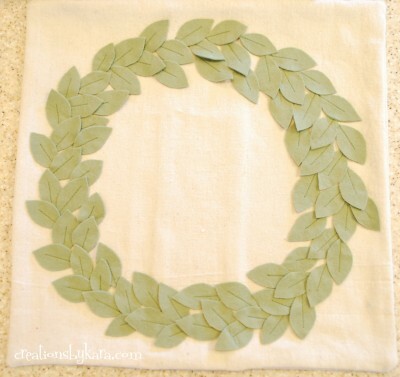 My leaves were approximately 2 inches long, and I used about 80 of them. They do not all need to be exactly the same size. 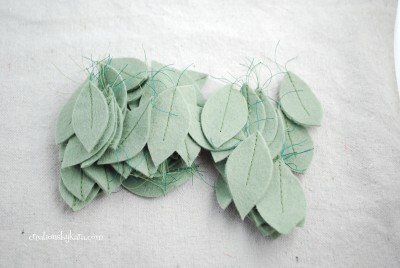 Pick a thread that is slightly darker than your felt. 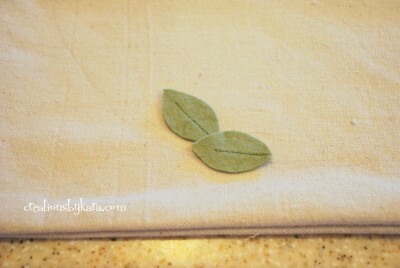 Place your needle close to the back of the leaf. 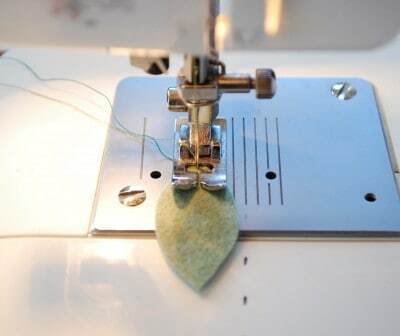 It can’t be right on the edge or it bunches up when you start stitching. 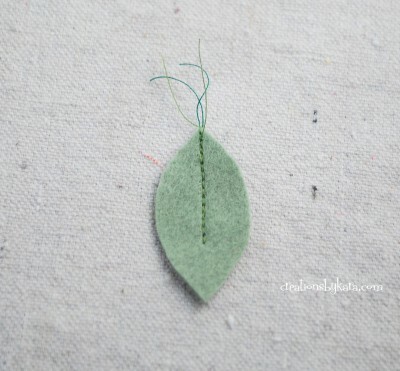 Sew about 2/3- 3/4 of the way across the leaf. 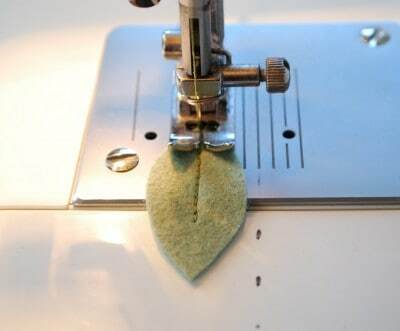 Now use your reverse button and stitch backwards all the way to the end of the leaf. Leave about 1″ of thread at the end. For this next part, I’m going to tell you how I wish I would have done it. 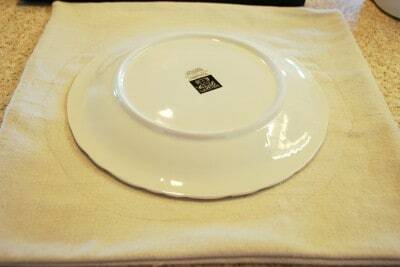 Take a dinner plate and place it in the middle of your pillow fabric. 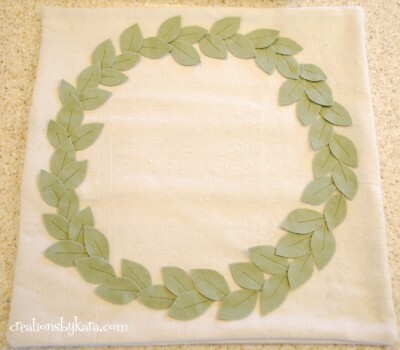 Trace around it to make a circle guide for the wreath. I didn’t think my plate was big enough, so I traced around it 1″ out. That was a mistake. 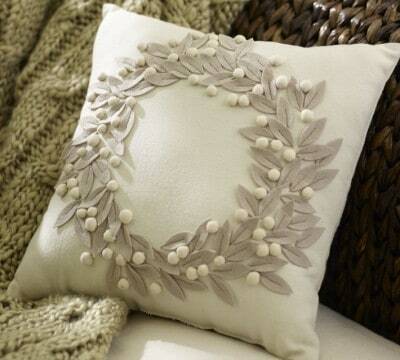 I think my pillow would have looked better if the wreath wasn’t so close to the edge. So don’t be like me. Just trace the dang plate! 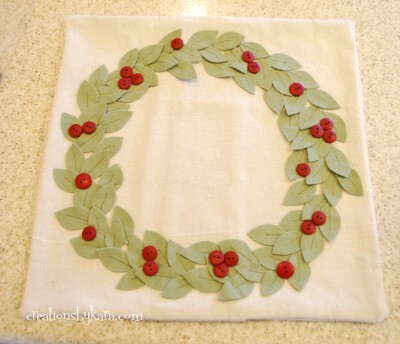 Now you are ready to form your wreath. 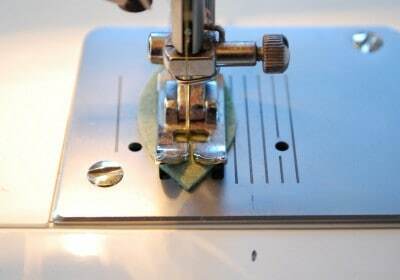 Here is where that 1″ of extra thread on the end comes in handy. 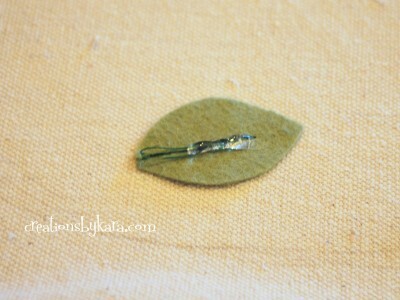 Rather than tying knots in all of them, just fold the threads over to the back and add some hot glue. Now flip it over and attach it to your pillow. 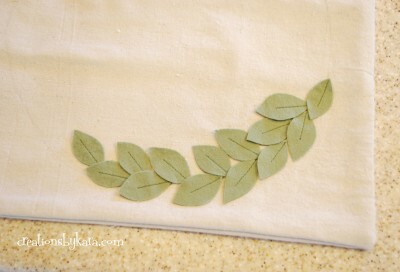 I worked from left to right so I could cover up the end of the first leaf with the second and so forth. Keep adding leaves, using your pencil line as a guide. I went all the way around my circle adding the two layers. Then I went back and filled in the center. Pottery Barn used pom poms for their wreath, but I didn’t like the color of red pom-poms I found, so I decided to use buttons instead. You can use whatever you like. I simply arranged them how I liked, then went back and attached them with a bit of hot glue. I love this but am sewing the buttons on as well. That is a great idea Shirley! Love the style of this pillow but I would like someway to be able to wash it. Any suggestions? I’ve never washed mine, but you could try carefully washing it in cold water. I would just line dry it, then carefully iron out any wrinkles with a warm iron. Hopefully it works! Oh this turned out great! Love it. Charming! I’m trying to talk myself into attempting this. Thanks for the tips too! Your pillow is one of my favorite Christmas pillows I’ve ever seen! I wish I had discovered this tutorial sooner, but I’ve pinned it for next year. Well, with all of those leaves I may start now. Thanks! I’m following you. Your pillow is gorgeous! I love your version! Your did such a beautiful job! love it! you did a great job! Pinning this for later! Beautiful pillow! PB should hire you to design for them. I would add a safety feature to the pattern if you have small children in the house over the holidays, sew the buttons instead of using a glue gun. Might keep them on the pillow and not in a toddlers mouth. This is BEAUTIFUL! I am featuring it this week. Thank you for linking up to my party last week! I agree with everyone else-your cushion looks amazing and way better than the PB version. You are so clever! Hey, thanks for linking up! You did an awesome job on that! Great job! It looks fantastic….great inspiration for the rest of us! Thank you for sharing!! LOVE this Kara! A million times better than Pottery Barn! I love your pillow and the colors look so nice. Thanks for taking the time to post a tutorial! Beautiful! I love that you added color to it 🙂 Great winter pillow! This is really beautiful Kara! Super cute! I love your version. Beautiful, I’m definately going to try this! Thanks for sharing! Love it! Can’t wait to make one! 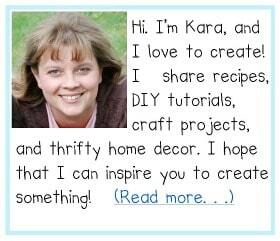 This is terrific, Kara!! I think I like yours even more than the original!